To design clear guidelines for the staging and follow-up of patients with ovarian cancer, and to provide the radiologist with a framework for use in multidisciplinary conferences. Guidelines for ovarian cancer staging and follow-up were defined by the female imaging subcommittee of the ESUR (European Society of Urogenital Radiology) based on the expert consensus of imaging protocols of 12 leading institutions and a critical review of the literature. Computed tomography (CT) with coverage of the base of the lungs to the inguinal region is regarded as the imaging technique of choice for preoperative staging. Critical diagnostic criteria are presented and the basis for a structured report for preoperative staging is outlined. Following primary treatment for ovarian cancer, clinical assessment and CA-125 are routinely used to monitor patients. 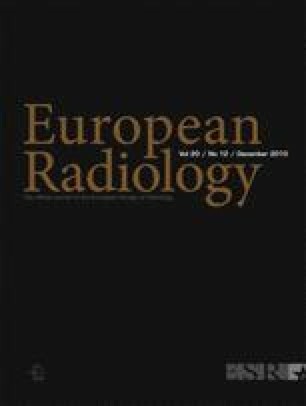 For suspected recurrence, CT remains the imaging modality of choice, with positron emission tomography (PET)/CT emerging as the optimal imaging technique for suspected recurrence, particularly in patients with negative CT or magnetic resonance imaging (MRI). CT is the imaging modality of choice for preoperative staging and detection of recurrence in patients with ovarian cancer. We are grateful to the following members of the female imaging subcommittee who contributed discussion of the guidelines and responded to a questionnaire about current practice in their institutions: C. Balleguier, M. Bazot, M.T. Cunha, F. Danza, B. Hamm, R. Kubik, G. Sallustio and A.C. Tsili. Ideally, patients fast for 4 h.
Bowel opacification, usually applied orally with 1,000 ml of diluted contrast media or alternatively water 1 h before the CT study, is generally recommended. Water facilitates differentiation of bowel loops from tiny calcifications, but small peritoneal implants may be better visualised with positive opacified bowel loops . Rectal opacification aids in assessing local invasion, particularly in large tumours but is reserved for problem solving. Alternatively, an aliquot of oral contrast medium may be given at 6-8 h before examination to aid colonic opacification. It is taken at bedtime for a morning examination and on rising for an afternoon examination. The use of intravenous contrast medium is mandatory for staging. A portal venous phase examination (at 70-90 s) is suggested, as solid enhancing components and papillary projections in adnexal masses and in implants may be missed in an early phase. The value of a dual-phase (arterial and portal venous) protocol has not been assessed. It may, however, be useful for large adnexal masses . Reformatted images, using 3- to 5-mm slice thickness at 3- to 4-mm intervals in transaxial, coronal and sagittal planes allow assessment of morphology and local extent of ovarian cancer and of peritoneal carcinomatosis. As radiation protection is a concern, techniques with tube modulation and automatic current settings are recommended in imaging of the pelvis in general, and particularly in women with extensive subcutaneous fat . The use of antiperistaltic agents is recommended to optimise image quality, particularly in assessing peritoneal implants and for diffusion-weighted imaging . Bowel preparation with diluted barium sulphate may be performed, however at the expense of increased imaging time . Imaging sequences include a T1W sequence, T2-weighted (W) sequences of the pelvis in axial, sagittal and coronal planes, and T2W with fat saturation (FS) and T1W with gadolinium and FS for the whole examination field, the latter at least in two planes. Slice thickness should not exceed 6 mm in the pelvis and 10 mm in the upper abdomen. DW-MRI seems a new promising technique as it provides a new contrast mechanism in assessing peritoneal carcinomatosis . The optimal b value is not yet established and reported b values for diagnosing peritoneal implants range from 400-500 to 800-1,000 s/mm2 . DW-MRI combined with conventional imaging sequences seems most accurate for the depiction of peritoneal metastases . Contrast-enhanced MRI should be performed not longer than 10 min after contrast medium application, because contrast medium diffusion into ascites may occur. In patients with renal insufficiency, the use of gadolinium-based contrast media has to be cautiously estimated . In these patients, thin-slice T2W imaging with FS and transaxial DWI will provide depiction of implants at least of more than 1-2 cm in size.